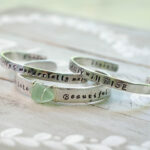 b e a u t i f u l .
Each piece of beach glass is unique and each bracelet will be similar to the original but not exact. 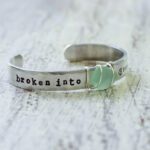 That’s what makes beach glass and hand stamping so special…each one is an original just like YOU! Cuff is adjustable and fits most adult wrist sizes. Made to Order meaning please allow 5-10 business days to create and ship your bracelet. We strive to get them shipped as soon as possible.